"Hymenoclea" redirects here. For the genus of moth, see Hymenoclea (moth). For other uses, see Ragweed (disambiguation). Ragweeds are flowering plants in the genus Ambrosia in the aster family, Asteraceae. They are distributed in the tropical and subtropical regions of the Americas, especially North America, where the origin and center of diversity of the genus are in the southwestern United States and northwestern Mexico. Several species have been introduced to the Old World and some have naturalized and have become invasive species. Ragweed species are expected to continue spreading across Europe in the near future in response to ongoing climate change. Other common names include bursages and burrobrushes. The genus name is from the Greek ambrosia, meaning "food or drink of immortality". 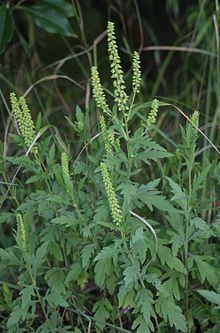 Ragweed pollen is notorious for causing allergic reactions in humans, specifically allergic rhinitis. Up to half of all cases of pollen-related allergic rhinitis in North America are caused by ragweeds. Ragweeds are annual and perennial herbs and shrubs. Species may grow just a few centimeters tall or well exceed four meters in height. The stems are erect, decumbent or prostrate, and many grow from rhizomes. The leaves may be arranged alternately, oppositely, or both. The leaf blades come in many shapes, sometimes divided pinnately or palmately into lobes. The edges are smooth or toothed. Some are hairy, and most are glandular. Ragweeds are monoecious, most producing inflorescences that contain both staminate and pistillate flowers. Inflorescences are often in the form of a spike or raceme made up mostly of staminate flowers with some pistillate clusters around the base. Staminate flower heads have stamens surrounded by whitish or purplish florets. Pistillate flower heads have fruit-yielding ovules surrounded by many phyllaries and fewer, smaller florets. The pistillate flowers are wind pollinated, and the fruits develop. They are burs, sometimes adorned with knobs, wings, or spines. 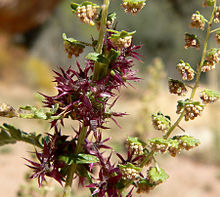 Many Ambrosia species occur in desert and semi-desert areas, and many are ruderal species that grow in disturbed habitat types. Ragweed pollen is a common allergen. A single plant may produce about a billion grains of pollen per season, and the pollen is transported on the wind. It causes about half of all cases of pollen-associated allergic rhinitis in North America, where ragweeds are most abundant and diverse. 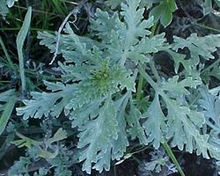 Common culprits are common ragweed (A. artemisiifolia) and great ragweed (A. trifida). Concentration of ragweed pollen—in the absence of significant rainfall, which removes pollen from the air—is the lowest in the early morning hours (6:00 AM), when emissions starts, and pollen concentration peaks at midday. Ragweed pollen can remain airborne for days and travel great distances, affecting people hundreds of miles away. It can even be carried 300 to 400 miles (640 km) out to sea. Ragweeds native to the Americas have been introduced to Europe starting in the nineteenth century and especially during World War I, and have spread rapidly there since the 1950s. Eastern Europe, particularly Hungary, has been badly affected by ragweed since the early 1990s, when the dismantling of Communist collective agriculture led to large-scale abandonment of agricultural land, and new building projects also resulted in disturbed, un-landscaped acreage. The major allergenic compound in the pollen has been identified as Amb a 1, a 38 kDa nonglycosylated protein composed of two subunits. It also contains other allergenic components, such as profilin and calcium-binding proteins. Ragweed allergy sufferers may show signs of oral allergy syndrome, a food allergy classified by a cluster of allergic reactions in the mouth in response to the consumption certain fruits, vegetables, and nuts. Foods commonly involved include beans, celery, cumin, hazelnuts, kiwifruit, parsley, potatoes, bananas, melons, cucumbers, and zucchini. Because cooking usually denatures the proteins that cause the reaction, the foods are more allergenic when eaten raw; exceptions are celery and nuts, which may not be safe even when cooked. Signs of reaction can include itching, burning, and swelling of the mouth and throat, runny eyes and nose, hives, and, less commonly, vomiting, diarrhea, asthma, and anaphylaxis. These symptoms are due to the abnormal increase of IgE antibodies which attach to a type of immune cell called mast cells. When the ragweed antigen then attaches to these antibodies the mast cells release histamine and other symptom evoking chemicals. Merck & Co, under license from allergy immunotherapy (AIT) company ALK, has launched a ragweed allergy immunotherapy treatment in sublingual tablet form in the US and Canada. Allergy immunotherapy treatment involves administering doses of the allergen to accustom the body to induce specific long-term tolerance. Chemical spraying has been used for control in large areas. Because ragweed only reacts to some of the more aggressive herbicides, it is highly recommended to consult professionals when deciding on dosage and methodology, especially near urban areas. [by whom?] Effective active ingredients include those that are glyphosate-based (Roundup, Glyphogan, Glialka), sulfosate-based (Medallon), and glufosinate ammonium-based (Finale 14SL). In badly infested areas, 2 to 6.5 liters per hectare (0.2–0.7 U.S. gal/acre) are usually dispersed. In 2007 several Ambrosia artemisiifolia populations were glyphosate resistant, exclusively in the USA. Where herbicides cannot be used, mowing may be repeated about every three weeks, as it grows back rapidly. In the past, ragweed was usually cut down, left to dry, and then burned. This method is used less often now, because of the pollution caused by smoke. Manually uprooting ragweed is generally ineffective, and skin contact can cause allergic reaction. If uprooting is the method of choice, it should be performed before flowering. There is evidence that mechanical and chemical control methods are actually no more effective in the long run than leaving the weed in place. Fungal rusts and the leaf-eating beetle Ophraella communa have been proposed as agents of biological pest control of ragweeds, but the latter may also attack sunflowers, and applications for permits and funding to test these controls have been unsuccessful. The beetle has, however, appeared in Europe, either on its own or as an uncontrolled introduction, and it has started making a dent into Ambrosia populations there. ^ "Global Compositae Checklist". Retrieved 6 March 2015. ^ a b c d e f Ambrosia. Flora of North America. ^ a b c León de la Luz, José Luis; Rebman, Jon P. (June 2010). "A new Ambrosia (Asteraceae) from the Baja California Peninsula, Mexico". Boletín de la Sociedad Botánica de México. 86 (6): 65–70. ^ Rasmussen, Karen; Thyrring, Jakob; Muscarella, Robert; Borchsenius, Finn (16 March 2017). "Climate-change-induced range shifts of three allergenic ragweeds (Ambrosia L.) in Europe and their potential impact on human health". PeerJ. 5: e3104. doi:10.7717/peerj.3104. PMC 5357339. PMID 28321366. ^ Ambrosia. Integrated Taxonomic Information System (ITIS). ^ Ambrosia. The Jepson eFlora 2013. ^ a b Taramarcaz, P.; et al. (2005). "Ragweed (Ambrosia) progression and its health risks: will Switzerland resist this invasion?" (PDF). Swiss Medical Weekly. 135 (37/38): 538–48. ^ Genus Ambrosia. Arizona-Sonora Desert Museum. ^ Payne, Willard W. (October 1963). "The Morphology of the Inflorescence of Ragweeds (Ambrosia-Franseria: Compositae)". American Journal of Botany. 50 (9): 872–80. doi:10.2307/2439774. JSTOR 2439774. ^ Samter, M. and D. W. Talmage. Immunological Diseases 3rd ed. Volume 2. Boston: Little Brown. 1978. pg. 788. ISBN 0-316-76985-1 "It is estimated that a single plant produces 1 billion shafts of pollen, or that 1 square mile of ragweed plants produces 16 tons of pollen". ^ Rees, A. M. Consumer Health USA: Essential Information from the Federal Health Network 2nd ed. Volume 2. Westwood, Connecticut: Greenwood, 1997. pg. 32. ISBN 1-57356-068-5 "Each ragweed plant produces about one billion pollen grains during an average allergy season". ^ Barnes, Charles; Pacheco, Freddy; Landuyt, Julie; Hu, Frank; Portnoy, Jay (2001). "Hourly variation of airborne ragweed pollen in Kansas City". Annals of Allergy, Asthma & Immunology. 86 (2): 166–71. doi:10.1016/S1081-1206(10)62686-5. PMID 11258685. ^ Wopfner, Nicole; Gadermaier, Gabriele; Egger, Matthias; Asero, Riccardo; Ebner, Christof; Jahn-Schmid, Beatrice; Ferreira, Fatima (2005). 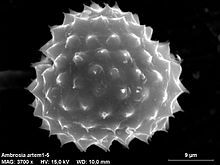 "The Spectrum of Allergens in Ragweed and Mugwort Pollen". International Archives of Allergy and Immunology. 138 (4): 337–46. doi:10.1159/000089188. PMID 16254437. ^ a b c Oral Allergy Syndrome. Canadian Food Inspection Agency. ^ Owen, Judith (2013). Immunology. New York: W. H. Freeman and Company. p. 493. ISBN 978-14292-1919-8. ^ Moingeon, P.; Batard, T.; Fadel, R.; Frati, F.; Sieber, J.; Overtvelt, L. (2006). "Immune mechanisms of allergen-specific sublingual immunotherapy". Allergy. 61 (2): 151–65. doi:10.1111/j.1398-9995.2006.01002.x. PMID 16409190. ^ Stephen B Powles (April 2008). "Evolved glyphosate-resistant weeds around the world: lessons to be learnt". Pest Management Science Pest Management Science. 64 (4): 360–365. doi:10.1002/ps.1525. ^ a b Lewis, Alan J. (1973). "Ragweed Control Techniques: Effect on Old-Field Plant Populations". Bulletin of the Torrey Botanical Club. 100 (6): 333–8. doi:10.2307/2484099. JSTOR 2484099. ^ H Müller-Schärer, S T E Lommen, M Rossinelli, M Bonini, M Boriani, G Bosio, U Schaffner: Ophraella communa, the ragweed leaf beetle, has successfully landed in Europe: fortunate coincidence or threat? 25 January 2014, doi:10.1111/wre.12072. ^ Shiyake S., Moriya S., Expansion of Ophraella communa LeSage in east Asia, in Insect Nat., vol. 40, 2005, pp. 11-13. ^ Ambrosia. The Plant List. Wikimedia Commons has media related to Ambrosia. GRIN Species Records of Ambrosia. Germplasm Resources Information Network (GRIN).